We've been stuck in a chilly, below-normal pattern for 10 days and counting. (That's on top of a cool October too.) But I hope you fully realize just how cold it's going to get for Thanksgiving — certainly one of the coldest turkey days in history. Tuesday morning is starting off with a subtle chill in the air. Thermometers across most of New Jersey are in the 40s. There are a few 30s in North Jersey. The only weather station in the entire state reading at-or-below freezing is High Point — elevation 1,388 feet. Radar shows sprinkles passing through the state. (Skip the umbrella — they're spotty and very light.) 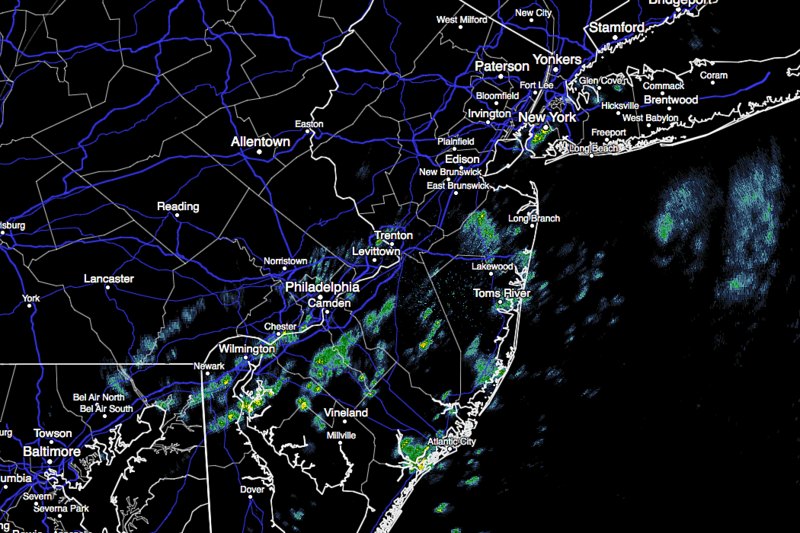 There could be a few flurries flying around colder North Jersey too. And patchy fog seems to be a bit more pervasive than Monday morning. Visibilities are down a bit throughout most of the Garden State. The sprinkle, flurry, and fog threat will end by 10 a.m. Tuesday, and then skies will clear to partial sunshine by Tuesday afternoon. It will become breezy (10 to 20 mph) and somewhat cool, with high temperatures in the upper 40s to lower 50s. Overall, not a terrible day. Tuesday night will be quiet, although I can't rule out a few flurries. Skies will be mostly clear overnight, with low temperatures falling to around the freezing mark (lower 30s). The best word to describe Wednesday's forecast? Blustery. Westerly wind gusts will regularly peak over 30 mph, keeping temperatures at bay in the lower to maybe mid 40s. Skies will be partly to mostly sunny. It's worth mentioning that models have been on-and-off showing some lake effect snow showers from Lake Ontario reaching New Jersey late-day Wednesday. At the moment, latest guidance suggests nothing to worry about. But it's worth keeping in mind (at least from a meteorological perspective). While I'm not worried about any accumulation whatsoever, a heavier snow squall could reduce visibility for one of the busiest travel days of the year. The forecast for Thanksgiving Thursday is cold. Very cold. Frigid, even. Morning lows will dip into the teens and 20s across the state. Afternoon highs will be limited to the upper 20s to around 30 degrees. 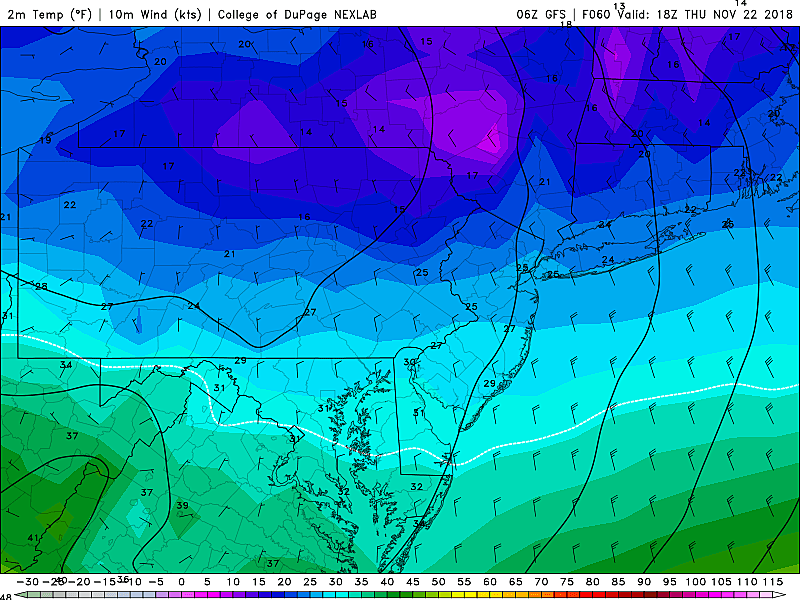 I suspect the vast majority of New Jersey will be stuck below freezing all day. Brrr! Of course, the thermometer does not tell the whole story for our impending cold wave. A brisk northwesterly wind will continue on Thursday, sustained at 10 to 20 mph with possible gusts to 30 mph. That biting breeze will keep the wind chill ("feels like" temperature) in the 20s, at best, all day. Ouch! Black Friday will be cold too, with the potential for widespread teens in the morning and high temps in the lower to mid 30s. Winds will be significantly lighter, so there is some good news. Both Thursday and Friday will be sunny and dry. We'll warm back up for the weekend, with 50s possible on Saturday and Sunday. The warmup comes with clouds and some wet weather. Right now, the best chance for rain will be late Saturday to early Sunday, and then again on Monday. With almost a week for this forecast to evolve, I fear there might be a wintry component for at least part of the state if temperatures trend colder. Worth watching for now, especially since the timing coincides with end-of-Thanksgiving travel.